Figure 18.5. Model for the sequence of events and the role of NAC and SRP during co-translational targeting of the ribosome-bound nascent polypeptide chain. A: NAC binds the nascent polypeptide chain immediately upon its exit from the peptidyl transferase center. In the absence of a signal sequence, NAC prevents targeting of the nascent chain by blocking the membrane-binding site on the ribosome. B: In the presence of the signal sequence, SRP binds tightly to the ribosome and effectively competes with NAC, thus displacing it from the nascent polypeptide chain. C: When SRP is present, the translating ribosome gains the capacity for binding with endoplasmic reticulum membrane and putting the nascent chain in the transmembrane translocation channel. (T. Powers & P. Walter, Current Biology 6, 331-338, 1996). As mentioned above, in eukaryotic cells the nascent chain-associated complex (NAC) seems to be the first among cytoplasmic protein factors that interacts with ribosome-bound nascent chain emerging from the ribosomal PTC (Fig. 18.5 A). It has been demonstrated that NAC covers both the C-terminal section of the nascent polypeptide and a ribosomal site characterized by high affinity to a special receptor on the endoplasmic reticulum membrane (Lauring et al., 1995a, 19956). 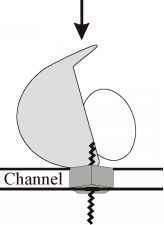 As a consequence the ribosome bearing the nascent chain fails to bind to the membrane until the NAC leaves it. In model systems this can be achieved by treatment of the ribosome/nascent chain complex with concentrated salt solutions, i.e., under non-physiological conditions. Such treatment disturbs the separation of the nascent polypeptide chains into those destined to be ultimately located in the cytosol and those normally directed into the exocytic pathway. In fact, in the absence of NAC the ribosomes synthesizing polypeptide chains of both types bind to the endoplasmic reticulum membrane thus allowing the resulting polypeptides to be translocated across the membrane albeit with efficiency radically depending on the presence of specific amino acid sequences. In a living eukaryotic cell the NAC is expelled from the ribosome by a 11S ribonucleoprotein complex termed as signal recognition particle, or SRP (see Section 18.4.4) (Fig. 18.5 B) that binds selectively with the nascent chains encompassing the so-called signal sequence (see the next Section 18.4.3). As a result the ribosome becomes capable of binding with the membrane and putting the nascent polypeptide into the translocation channel (Fig. 18.5 C). On the other hand, the polyribosomes synthesizing polypeptide chains lacking the signal sequence have no chance to be attached to the membrane and resulting polypeptides become resident cytosolic proteins. Thus, the binding of the nascent chain-bearing ribosome to the endoplasmic reticulum surface predetermines translocation of polypeptides across the membrane, this process being initially controlled by the NAC and SRP relationships (Lauring et al., 1995b; Powers & Walter, 1996). In 1971 Blobel and Sabatini proposed that mRNAs, which are to be translated by membrane-bound ribosomes, have a special sequence immediately following the initiation codon. This sequence codes for the characteristic N-terminal sequence of the nascent polypeptide, which provides a signal for recognition either by the membrane or by a factor mediating the association between the ribosome and the membrane. Thus, if a ribosome translates mRNA coding for the secretory or membrane protein, some time after initiation the N-terminal part of the growing peptide will protrude from the ribosome and signal the attachment to the membrane. In this case the ribosome becomes membrane bound. If the N-terminus of the growing peptide does not carry such a signal sequence, as is the case with water-soluble cytoplasmic proteins, the corresponding ribosomes (polyribosomes) will remain free throughout elongation (see also Blobel, 1980). Independent experimental evidence for the existence of special N-terminal sequences in newly synthesized polypeptide chains of certain secretory proteins of eukaryotic cells appeared a short time after. The first example was that translation of mRNA coding for the light chain of immunoglobulin in the cellfree system on free ribosomes yielded a polypeptide which had an additional sequence at the N-terminus compared to the authentic light chain of the immunoglobulin; translation of the same mRNA in the presence of microsomes yielded a normal product (Milstein et al., 1972). 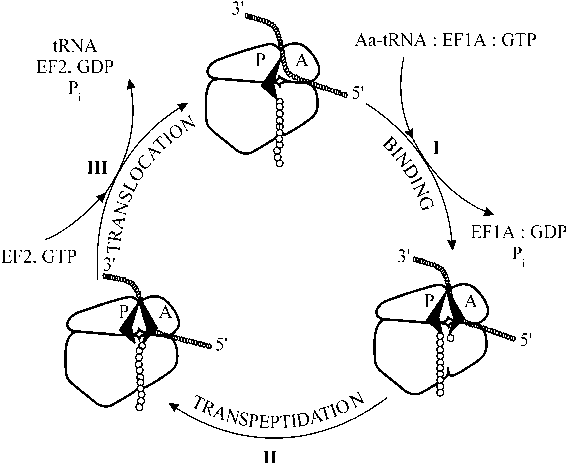 It has been concluded that translation of the first mRNA codons results in the synthesis of the N-terminal signal sequence which determines the attachment of the ribosome to the membrane; in the course of further elongation this sequence is cleaved off on the membrane, and the final product does not contain it. More refined work using purified components of the same in vitro system (Blobel & Dobberstein, 1975) laid the ground for the elucidation of the matter. Also it has been demonstrated that such an N-terminal sequence is rich in hydrophobic aminoacyl residues (Schechter et al., 1975); therefore, it was natural to conclude that the hydrophobic nature of the signal sequence of the nascent polypeptide chain contributes to the interaction of the polypeptide with the membrane. Similar additional N-terminal sequences are also characteristic of the nascent chains of a number of bacterial proteins, exported from the cytoplasm (Inouye & Beckwith, 1977). In gram-negative bacteria the export of proteins takes place either into the periplasmic space (as for alkaline phosphatase, maltose-binding protein, arabinose-binding protein, and penicillinase) or into the outer membrane (as for outer membrane lipoprotein and l-receptor). The beginning of the synthesis of proteins destined for exportation from the cell seems to be followed by their hydrophobic N-terminal sequences interacting with the inner cytoplasmic membrane of the bacterial cell, so that the subsequent steps of their synthesis proceed on the membrane-bound ribosomes. Cleavage of the N-terminal sequences may take place during or, in some cases, following elongation. After synthesis has been completed and after the termination of translation, the protein passes into the periplasmic space and then, depending on the hydrophobicity or hydrophilicity of its surface, either remains in the periplasmic space as a water-soluble protein or is integrated into the outer membrane. All this is very similar to the situation with secreted proteins in eukaryotic cells. Thus, numerous secretory proteins of Eukaryotes have been reported to be synthesized with an additional N-terminal sequence that is later cleaved off on the membrane during protein synthesis. If the corresponding mRNAs are translated in the cell-free system in the absence of membranes, then elongated products referred to as pre-proteins are formed. Cleavage of the N-terminal signal sequence usually does not take place when the membranes (the microsomal fraction) are added to the system after the synthesis of the pre-protein is completed or even at the late stages of elongation. Only if membranes are present in the system from the beginning, or if they are added soon after the emergence of the N-terminal section of the polypeptide from the ribosome, the ribosome attaches to the membrane, the nascent peptide enters the membrane, and cleaving off of the signal sequence takes place. Elongation of the peptide in an aqueous medium above a certain size seems to result in peptide folding, which screens the hydrophobic N-terminal region and thus prevents its interaction with the membrane. The signal sequences of this type usually include 15 to 30 amino acid residues at the amino terminus of a nascent polypeptide chain (von Heijne, 1988). Three regions with different properties can be distinguished in the following order: a short n (amino-terminal) region, positively charged in most cases, a hydrophobic h region in the middle of the signal sequence, and a conservative c region preceding the cleavage site in the nascent chain. The h region, composed mainly of Leu, Ala, Ile, Phe, and Trp, is 10±3 residues long. In this respect it differs from membrane-spanning sequences (24±2 residues) and from hydrophobic segments of globular proteins (6-8) residues. The major feature of the h region is its overall hydrophobicity; there is also evidence for its helicity. The composition of the c region (5 to 7 residues) obeys the so called "-1, -3 rule", according to which the -1 position at the cleavage site has to be occupied by Ala, Ser, Gly, Cys, Thr or Gln only, and the -3 position must be free of aromatic (Phe, His, Tyr, Trp), charged (Asp, Glu, Arg, Lys) or large polar (Asn, Gln) residues. Besides, no Pro exists in the -3 to +1 region. Obviously, these severe restrictions in the amino acid composition are compatible with the fact that signal sequences of a variety of polypeptide chains involved in the cotranslational import into the endoplasmic reticulum are cleaved by a common signal peptidase. Though signal sequences are non-homologous to each other and variable with respect to their size, they have a common basic feature, an ability to guide even foreign passenger. Some integral membrane proteins (type II proteins, see below, Fig. 18.11 A) encompass an internal signal sequence located at some distance (30-150 residues) from the amino terminus. Such a sequence usually ranges from 20 to 30 hydrophobic and non-polar residues (23±3 residues most often) preceded by a cluster of positively charged residues at its amino terminal end. The proteins with such an internal signal are cotranslationally imported into the endoplasmic reticulum using SRP, SRP receptor and the same translocation apparatus as the proteins with the cleavable signal sequence. In this particular case, proteolytic processing of a nascent chain does not occur because of the absence of the cleavage site matching the "-1, -3 rule", and the completed polypeptide chain does not leave the membrane. Another possible cause for long hydrophobic signal sequences to be uncleavable is the remoteness of their C-termini from the signal peptidase located in the membrane. A general scheme of the process of the attachment of the translating ribosome/nascent polypeptide to the ER membrane is depicted below, in Fig. 18.8. If the nascent polypeptide contains the signal sequence, the ribosome with the nascent chain interacts in the cytosol with SRP. The resulting complex, in which elongation of the nascent chain is arrested by SRP (see Section 13.2.4), migrates in the cytoplasm until it finds a specific receptor (SRP receptor) on the endoplasmic reticulum surface. This interaction results in the release of the ribosome with nascent chain from SRP and in the insertion of the nascent chain into a translocation channel in the membrane. From this point on, the nascent chain continues to grow into the lumen of the endoplasmic reticulum. Then the signal sequence either is cleaved by a specific endopeptidase or becomes inserted into the endoplasmic reticulum membrane. In the former case the completed chain is, in parallel with its covalent modifications (see Section 18.6), folded and continues to travel to the cell surface along the exocytic pathway as a soluble protein. The latter case is specific to membrane proteins located finally in the endoplasmic reticulum, the Golgi apparatus, the plasma membrane, etc. Shortly after emerging from the ribosome (i.e., after 35-40 initial steps of elongation), all nascent polypeptide chains, whether they bear the signal sequence or not, interact with the nascent-chain associated complex (NAC) somehow involved in their folding. However, in the nascent chains with signal sequence NAC is replaced by the signal recognition particle (SRP) after 60-70 steps of elongation (Powers & Walter, 1996). Both the signal sequence and the ribosome are involved in SRP binding, which results in the arrest of elongation (see Section 13.2.4). kDa. Four of them are grouped in heterodimers (SRP9/14 and SRP68/72), while two others exist as monomers located together in the same region of the SRP (Fig. 18.6). Figure 18.6. Model of the subunit structure of the mammalian 11S SRP. The constituent 7S RNA forms a well developed secondary structure with helical regions numerated from 2 to 8. 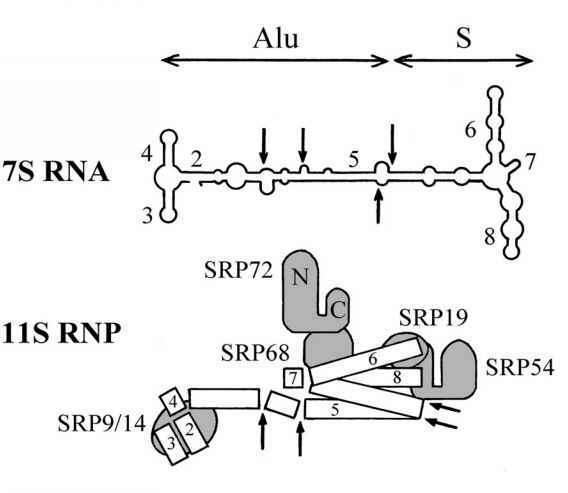 In the 11S SRP the RNA is further folded into a more compact form. The SRP proteins are attached to their binding sites on corresponding regions of the folded RNA. Nuclease-sensitive sites are indicated by arrows. (H. Lutcke, Eur. J. Biochem. 228, 531-550, 1995).